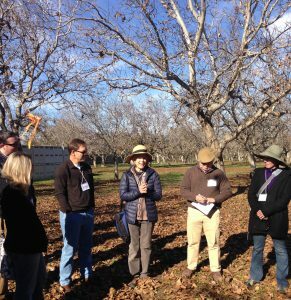 Dr. Louise Jackson (center) highlights healthy soils climate solutions at Dixon Ridge Farms, Dec. 1, 2015. This week, at a meeting of the Environmental Farming Act Science Advisory Panel, the California Department of Food and Agriculture (CDFA) released its draft framework for the new Healthy Soils Initiative, a program aimed at providing financial incentives for farmers and ranchers to increase soil carbon and reduce greenhouse gas emissions. The new framework can be found by clicking here (scroll to page 12, after the SWEEP slides). CDFA proposes spending $13.8 million in the first year of the program on financial incentives for growers to build soil carbon and reduce greenhouse gas emissions overall. An additional $4 million is proposed for on-farm demonstration projects that bring together agricultural partners, including growers, to field test management practices that provide climate benefits. CDFA is soliciting public comment on the draft framework and its future iterations from now until August 2016. Assuming funding is finalized by the June budget (read more here), the Healthy Soils Request for Proposals would go out in September or October with applications due the following month. The first grant awards would be announced by February. The CDFA draft framework includes a list of farm management practices that would be eligible for financial incentive. They include over 20 practices such as cover cropping, mulching, replacing synthetic N fertilizer, hedgerow planting, etc. Not included are practices like conservation tillage (no-till is included), crop rotation or prescribed/managed grazing. This is a preliminary list and there is opportunity to weigh in on practices that you think should be included on the list for their ability to improve soil carbon and reduce greenhouse gas emissions. The Air Resources Board will soon take up the issue of how to quantify the greenhouse gas emission reductions from on-farm management practices. Among the possible tools is COMET-Planner (based off of COMET-Farm), both developed for the USDA by Colorado State University. The COMET-Farm uses the DayCent model to simulate fluxes of carbon and nitrogen on working lands. Have any feedback on the Healthy Soils Initiative? Drop us a line: info@calclimateag.org. You can also sign up to receive CDFA’s email updates on the Healthy Soils Initiative by clicking here.